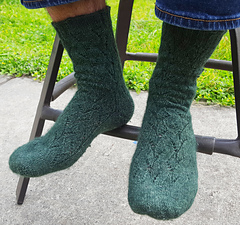 RMWLS are the perfect socks for your luxury sock yarn. I didn’t create any of the techniques or stitch patterns featured in the pattern, I just put together some of my favorite elements from my favorite sock patterns: Judy’s Magic Cast-On for the toe, TAAT (two at a time) socks on magic loop, simple and elegant lace pattern, German Short Row heel, K2 P2 ribbed cuff, and Russian BO to finish it off. You can substitute techniques at your leisure (knit one sock at a time, substitute a different heel, even work from the cuff down!) If you choose to follow the pattern, it is accessible to new sock knitters and explains the short row heels in detail. The sock is written for women (60 stitches) and men (72 stitches). The lace pattern is charted and written. 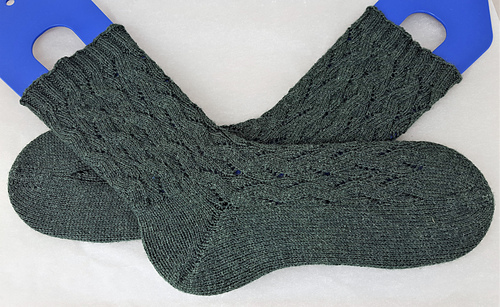 You can adjust the pattern for a variety of sock circumferences by varying needle size. The pattern pays attention to little details - like mirrored increases on the toes and no-hole short rows on the heel. The end result is a glamorous, elegant pair of socks! Visit the Knit Knerd blog for useful tutorials for techniques used in the pattern.